When a person goes for an annual check-up, and a physician tells her that her blood pressure is near “stroke city,” health measures are called for. Although the condition could be attributable to diet, lack of exercise, stress and all those lack-of-upkeep body factors, I’m inclined to believe that altitude could be a part of this equation. I mean, as I was brought up to be a flatlander and have been living at 25 feet above sea level for six months, then suddenly transfer to a residence 2000 feet above sea level, I’m convinced that this change alone could cause skyrocketing blood pressure. But, as readers know, physicians like to distribute pills, and that was the suggestion for lowering my soaring blood pressure. 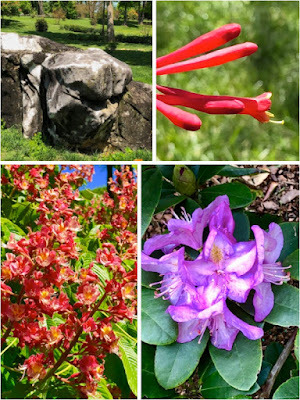 I discovered a 13-acre garden on the outskirts of Winchester, Tennessee, only a few minutes from Sewanee, that offered a meditative trail of slightly rolling landscape edged by large river stones and covered by flowering plants, trees, and large boulders. Also, the garden was empty certain hours of the morning when I liked to walk — preferably not on a full stomach. 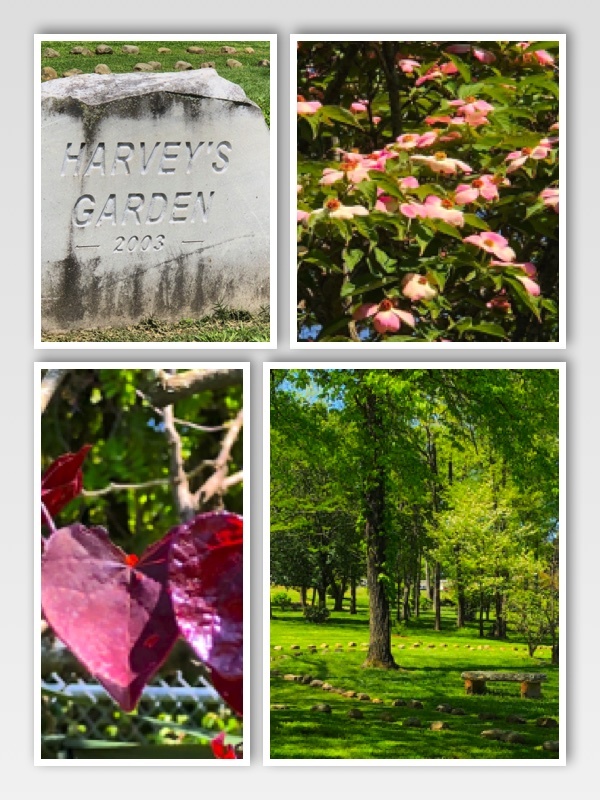 The garden is called Harvey’s Garden and is the handiwork of Handley and Becky Templeton, son and daughter-in-law of Harvey Templeton. Handley and his wife carried out the vision of his father for a contemplative garden. The third time I sauntered in the garden, I met a man walking along, picking up items of trash scattered about the trail. “What’s your job?” I asked, and he appeared to hide a smile. “No, I’m his nephew,” he replied. I felt foolish because I’d wrongly assumed he was the yard man. I knew, of course, that when drivers ascend the highway leading from the Valley up to The Mountain at Sewanee what comes directly into their view is the temple at the peak of The Mountain where the Templeton Library and a statue of John Templeton, the famous fund manager, banker, and philanthropist, stands. We chatted a few minutes, and Templeton told me about a second garden that the Templetons had established near the Winchester Country Club. I visited that garden the following day, but it lacked the shade and the abundant foliage of the first garden. I “sauntered” that trail also, but today I returned to the first one, and Dr. Sullivan took photographs of some of the more colorful plants. I especially like the red leafed redbud with its heart-shaped leaves, and the lavender rhododendron, along with ginkgo, crepe myrtle, hydrangea and a beautiful horse chestnut tree. Crows in nearby trees followed me on the trail and kept complaining about my invasion of their territory; at one point, diving toward me. Although the site is perhaps a fifteen-minute drive down The Mountain, and gasoline prices climb lately, the Valley has become my favorite place to walk. My blood pressure has dropped to within normal range for an 83-year old, thanks to the beautiful site of Harvey’s Garden and a sudden burst of sunny weather.